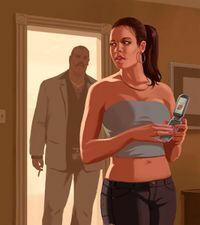 Mallorie Bardas-Bellic is a character in the HD Universe appearing in Grand Theft Auto IV. She is the twenty-nine-year old girlfriend and, later, fiancée and wife, of Roman Bellic. She is voiced by Elena Harvey Hurst. Mallorie was born in Puerto Rico, later moving to South Bohan, Bohan, Liberty City, occasionally working for Manny Escuela in South Bohan. At some point she met Roman Bellic and started working for him at his taxi depot in Hove Beach. Either before or after she started work with Roman, they started dating. Mallorie has been arrested on two occasions: in 1998 for joyriding and in 2002 for being in possession of a controlled substance (namely marijuana). Promotional artwork featuring Mallorie Bardas presumably on a date with Vladimir Glebov. In 2008 Roman's cousin Niko discovers that she is having an affair with Vladimir Glebov. Although Niko warns Vlad multiple times to stay away from her, Vlad blows off the threats. Eventually Roman sees Vlad's car parked outside of Mallorie's place and puts two and two together. Roman goes to Niko for support, but when Niko reveals that he had suspicions of the affair, it only makes Roman feel more upset and betrayed. Feeling bad about not informing Roman or doing more to stop the affair, Niko decides that it's time to deal with Vlad once and for all, and the cousins head to Comrades to put a final end to both Vlad and the affair. At the time Roman seems to want a peaceful solution to the problem and calls Niko a "hot headed chump" after he puts a bullet in Vlad's eye; later in the game he tells Mallorie that it was him, not Niko, that killed Vlad in a jealous fit of rage, and that Niko helped him dispose of the body. When Mallorie tells Niko this, he plays along and supports Roman's claim, and tells her that Roman is an "old school romantic". Later in the game after Dimitri has Roman's taxi depot and apartment destroyed, Mallorie's cousin allows Roman and Niko to stay at their flat in South Bohan. Mallorie introduces Niko to Manny Escuela and Elizabeta Torres. At the end of the game she marries Roman at a church in Suffolk and reveals that she is pregnant. 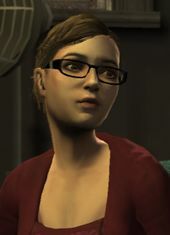 In the Revenge ending of the game, Roman and Mallorie tell Niko that if they have a daughter, they will name her Kate, after the late Kate McReary. (However it turns out shes pregnant with a boy.) During the Deal ending, Mallorie is left a widow and tells Niko that Roman Jr. will struggle without a father. South Bohan native of Puerto Rican descent. Family ties to drug dealers. Arrested on several accessory charges. In Niko's first apartment, there is a picture of a much younger looking Mallorie next to the bed, in a picture-frame. After Roman proposes to Mallorie her voicemail message changes. This is oddly not the case with Roman's voicemail. This page was last modified on 7 May 2014, at 20:11.